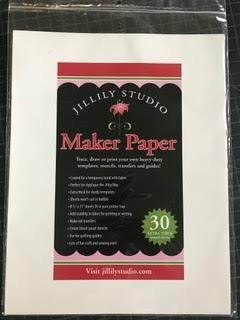 30 sheets of heavy coated paper for making templates, stencils, guides and more. These 8 ½” x 11” sheets fit into your printer tray and are 3 times thicker than regular freezer paper. When pressing the paper to fabric, the heat creates a temporary bond. They are perfect for making applique templates for beautiful applique results with no raw edges. Sheets won’t curl or bubble and can be layered for extra stability.